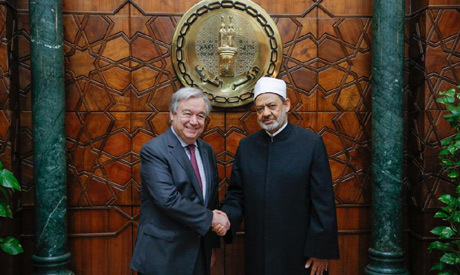 The UN’s head Antonio Guterres expressed solidarity with Muslims all over the world and denounced hate speech, racism, and anti-Semitism in Cairo on Tuesday, following a meeting with the head of Al-Azhar. The secretary-general’s comments at Al-Azhar headquarters, Egypt’s leading institution of Sunni Islamic learning, come less than a month after a terrorist attack on two New Zealand mosques killed 50 worshippers. “In this time of difficulties and division, we must stand together and protect each other. Nothing justifies terrorism, and it becomes particularly hideous when religion is invoked. We must uphold and promote human dignity and universal human rights,'' Guterres said following the meeting with Grand Imam Ahmed El-Tayyeb. Guterres said that Islam is currently a subject of an attack aimed at linking it with terrorism, although most of terrorism’s victims are Arabs and Muslims. The UN secretary-general highlighted Al-Azhar’s role as a model reflecting the true face of Islam, referring to Al-Azhar’s initiatives to open a dialogue with other religious institutions around the world, especially the Vatican, to help consolidate peace and global coexistence, adding that the whole world, not only Muslims, need the grand imam’s voice of wisdom and peace. Guterres called on the United Nations Alliance of Civilizations (UNAOC) to visit Al-Azhar and benefit from its pioneering expertise in promoting religious and civilisational coexistence. The United Nations Alliance of Civilizations is an initiative that aims to bridge divides and promote harmony among nations, all with a view toward preventing conflict and promoting social cohesion. El-Tayyeb expressed his appreciation for the sincere condolences offered by the UN secretary-general to the victims of the treacherous terrorist attack against Muslims in New Zealand, adding that Guterres’ previous work as United Nations High Commissioner for Refugees allows him to understand the suffering of innocent, oppressed people around the world. The Al-Azhar chief expressed the institution’s readiness to cooperate with the UN to consolidate their common goals of consolidating global peace and achieving equality among all human beings. El-Tayyeb reiterated Al-Azhar’s universal message of peace between human beings, confronting terrorism and establishing the principles of human fraternity, equality and justice. The grand imam referred to Al-Azhar’s efforts to strengthen dialogue with major religious institutions such as the Vatican and the World Council of Churches, in cooperation with the Muslim Council of Elders, to reach a document on human fraternity, which took a full year to prepare. In his capacity as chairman of the Council of Muslim Elders, the grand imam conveyed an official message to Guterres. He also handed the UN secretary-general a copy of the human fraternity document, signed by Al-Azhar and by Pope Francis during the Human Fraternity Global Conference held in Abu-Dhabi in February. The document, which is the fruit of over a one year and a half dialogue between Al-Tayyeb and Pope Francis, depicts the nature of relations among followers of different religions and highlights the role played by religions in the modern society. The UN secretary-general said that the document is of universal importance because it rejects extremism charges and clears Islam and Christianity of accusations of terrorism, pointing out that the UN will seek benefit from this document to promote world peace and security.